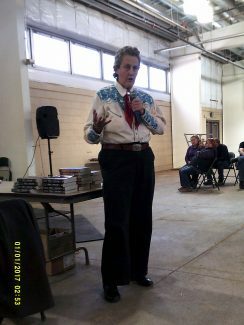 Temple Grandin is a world-reknown expert on humane livestock handling. 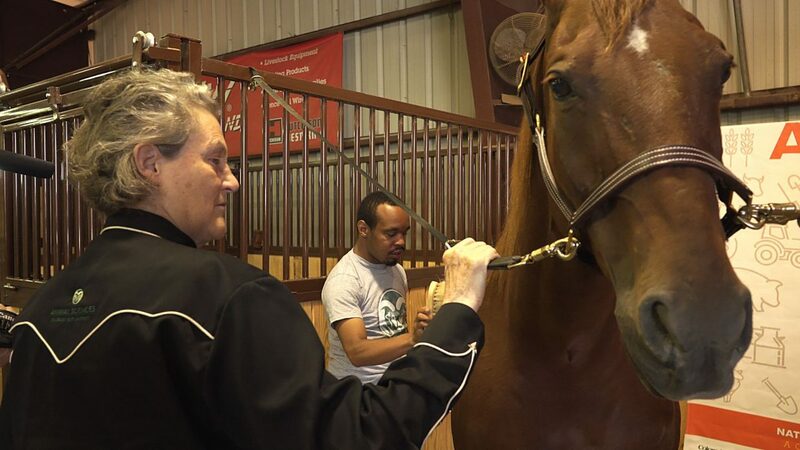 As a horse is prepared for an equine-assisted therapy sesion, Temple Grandin and an unnamed grooming assistant discuss the program. 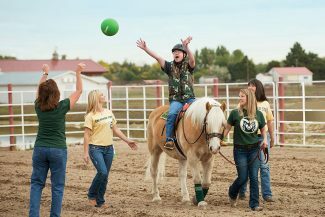 A student in the Poudre Valley School District, participates in an equine assisted activity hosted by the My Heroes Therapy group. 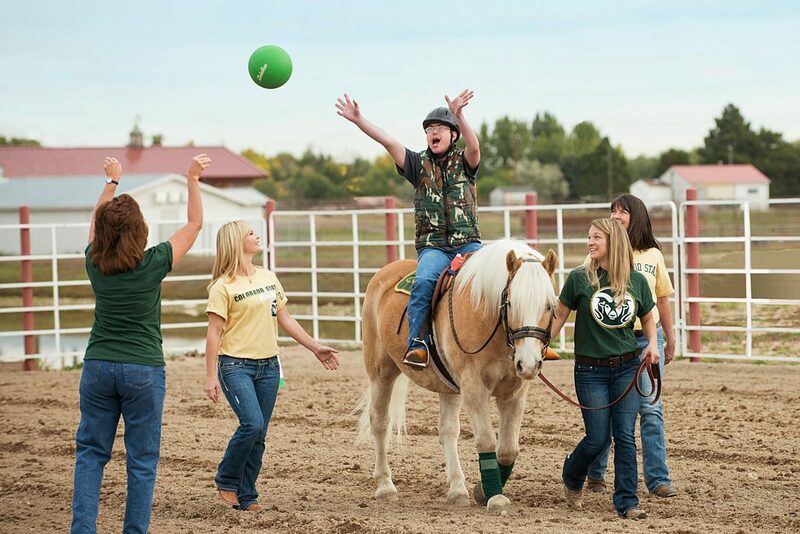 Colorado State University, a leader in equine science and occupational therapy research, will open a new, state-of-the-art facility on its Fort Collins Foothills Campus. The building, to be called the Temple Grandin Equine Center, will be dedicated to equine-assisted activities, therapies (EAAT), and research. The $6.5 million structure has already received a $1 million gift from Doug and Vivian Newton and a $1.1 million gift from the Bender Foundation. Additionally, a $500,000 grant from the WaterShed Animal Fund that will facilitate CSU becoming a regional training center for the Right Horse Initiative, which helps identify horses appropriate for adoption into EAAT programs. Further, a space devoted to the new equine center will be a permanent fixture at the National Western Center in Denver. EAAT sessions will be held there and at the CSU location, allowing greater accessibility to families along the Front Range, and beyond. Pending further fundraising activities, the groundbreaking for Phase 1 of the TGEC in Fort Collins is scheduled for 2018. The Denver facility should come online in 2021. The new facility's namesake, is a long-time equestrian who sought solace from animals at an early age. Throughout a lengthy career in education, she has repaid some of that heart-felt debt. "Horses were basically my salvation," said Temple Grandin. "If I had not been able to go down to the horse barn and clean the stalls, I would have just been miserable." Born in 1947 in Boston, Mary Temple Grandin was diagnosed with autism at age 2. Not much was known at the time about what is now considered a wide spectrum of conditions. In fact, doctors initially blamed her mother, Eustacia Cutler, for her daughter's communicative difficulties. Extensive speech therapy and a regime of other treatments began to draw the girl out. At age 4, Grandin finally spoke. School and other social interactions continued to be difficult, however, and fellow-students teased the sensitive child about her verbal tics. Grandin nevertheless flourished and achieved a high level of academic success, including a psychology degree, and masters and doctoral degrees in animal science. She began sharing her knowledge at public speaking engagements in the 1980s, supporting neurodiversity over the theory of a comprehensive cure for autism. An acclaimed activist for animal welfare, neurology and philosophy, Grandin proclaimed in her essay "Animals Are Not Things" that the law ultimately grants them specific protections. She has authored many books, including "Animals in Transition" and "Animals Make Us Human." "Nature is cruel, but we don't have to be," Grandin said. As a high-functioning person with autism, Grandin considers herself a primarily visual thinker with verbal communication a secondary skill. Her sensitivity to detail and environmental change gives her a unique insight into the minds of livestock and domesticated animals. These abilities coupled with her strong position on the education of autistic children have resulted in Grandin receiving many awards and honors. A 2010 HBO film entitled "Temple Grandin" received 15 Emmy nominations and five awards. An American PhD of animal science and a professor at CSU for more than 20 years, the best-selling author is a world-renowned consultant to the livestock industry on animal behavior. Grandin invented the "hug box," a device designed to calm those on the autism spectrum. Despite worldwide fame as an expert in her fields of knowledge, Grandin continues pursuing her studies. "I have heard from parents many times that their nonverbal child had their first word on a horse," she said. "I would like our research to figure out which sub-group of kids speak their first word on a horse." CSU recognizes the important role animal-human interaction plays in treating a wide array of mental and physical conditions. TGEC will work for the betterment of horses and humans alike. Classrooms, research, office, therapy and riding areas will share 40,000-plus square feet with a large riding arena supplemented by multiple viewing areas. 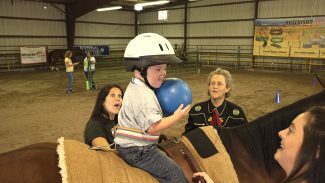 This facility is designed to be a comprehensive location that provides motivating activities and therapies; respite areas for family and caregivers; professional EAAT certifications for students; EAAT research opportunities for graduate students; continuing education for EAAT industry professionals; a host venue for EAAT industry seminars, clinics and conferences; a library of EAAT literature; horse care, conditioning and training. Other university programs will partner with the Equine Sciences Program in its ongoing quest to assist people with disabilities and other challenges. Occupational therapy, psychology, social work, health and exercise science, Adult Learner and Veteran Services, and veterinary medicine will combine to generate successful outcomes for all involved. "Equine-assisted activities and therapies hold the promise of improving quality of life for children, veterans and others whose interactions with these horses have brought them comfort and a renewed outlook on the world around them," said Ajay Menon, dean of the College of Agricultural Sciences. "We are tremendously grateful to our supporters who are committed to helping make the Temple Grandin Equine Center a reality." TGEC's programs, research, and educational opportunities will honor the contributions of the facility's namesake, Temple Grandin, as it showcases the healing powers of the equine species in assisting people with specific individual needs.